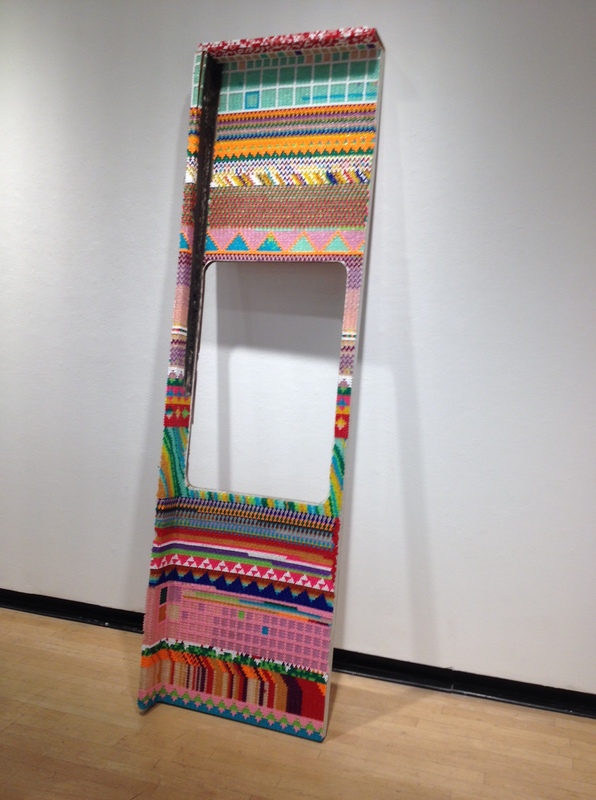 Her piece was tall and extremely colorful. It stood up against the wall and was the first thing that I really looked at when I walked in. I loved the bright bold colors and patterns of the beads. There was a mystery as to what the whole thing was, and what it was made out of. I at first thought of the whole thing as a window. I began thinking about the idea of being blinded and not seeing what is right in front of you. I am often so busy looking for things that I miss the beauty that is right where I am at that moment. I have been thinking about this idea a lot and had a beautiful moment with these thoughts as I admired her piece. The hole to me represented the window that I am constantly looking out of in search for things, and the beads were the simplistic beauty that is usually right in front of me. Talking with Dana was a privilege. Hearing about her process and inspiration was particularly inspiring. She wanted a sense of mystery with the work and decided to use typical simple objects. Her choice in using cheap plastic beads was very intentional too. She wanted to show that even tacky, and sometimes cheap, things can be beautiful and influential. I love this idea. It was also interesting learning that she created the beaded pattern spur of the moment. She just went row by row making whatever design and using whatever colors she wanted to use in that moment. I was really inspired by Dana and her piece “Field”. We seemed to have similar passions and ideas. I want to get back into making art from recycled and unwanted materials. Posted in UncategorizedTagged #art110, danafleming, flemingBookmark the permalink.